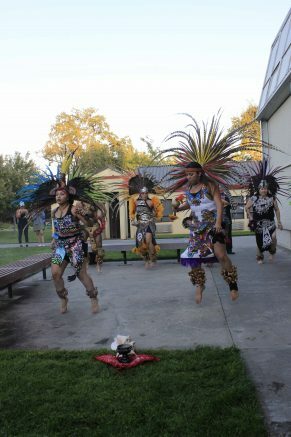 Aztec dancers perform at Kaneko GalleryAmerican River College hosted a reception on Thursday to showcase the artwork of Mexican artist Alfredo Abraham Endoqui Guerrero. The exhibition, “Arte Plumario”, which had a strong Aztec influence, was presented in a weeklong exhibit from Sept. 12-16 at the James Kaneko Gallery at ARC. The gallery was held in collaboration with the art club, the Native American Resource Center and ARC’s U.N.I.T.E. program. The reception also included a live performance by the Sacramento area Aztec dance group Maquilli Tonatiuh. “Arte Plumario,” or feathered art, is an ancient pre-Hispanic artistic custom where feathers of different sacred birds are used to decorate spears, fans, bracelets and sandals. Fabrics were integrated into designs for ceremonial wear and indicated social rank. The creations are painstaking, requiring patience and thought because every feather, every stitch and every image depicted has intentional meaning, according to Guerrero. “You need to have patience. If the piece you are working on calls for a green feather and you don’t have one, you need to wait,” said Guerrero, who is visiting Sacramento from Mexico. “…. you can create shields, fans, lances, use pieces of fabric that contain the feathers because for us and for the ancient people of Mexico, feathers are very important. Almost everything we use has feathers,” said Guerrero. The Arte Plumario exhibit is part of the Native American Resource Center’s quest to increase cultural awareness on campus. “It just made sense,” said Cualnezca Tonantzin Miranda, the cultural and community coordinator of the Native American Resource Center. The reception also included a performance by Aztec dance troupe Maquilli Tonatiuh Native Aztec Dancers of Sacramento. Maria Landeros, the “capitan” of Maquilla Tonatiuh, feels that these traditions send an important message which is critical to people of all nationalities. “People want to be a part of something. …. Our message as indigenous people is that we are to share with mankind that we are all in this together,” said Landeros. Aztec dancer Sofia Robles Castillo, an ARC alumni who is now a graduate student candidate for the nurse practitioner master’s program at University of California, Davis, agrees. She has been dancing since she was five years old and at 28 it is now a family tradition which involves her mother and other members of her family. “I think doing dance creates (a) definitely different sense of being grounded, spirituality and a different aspect that you wouldn’t get just going to school or in other family activities. It creates a strong sense of community and positivity,” said Castillo. The exhibit ran from Sept. 12-16 and was hosted by the Kaneko Art Gallery and the Native American Resource Center in collaboration with the ARC UNITE program. 1 Comment on "Aztec dancers perform at Kaneko Gallery"